Clinically, a lower intake of vitamin K has translated into a greater risk for myocardial infarction and stroke, plaque instability, and most recently, diabetes. 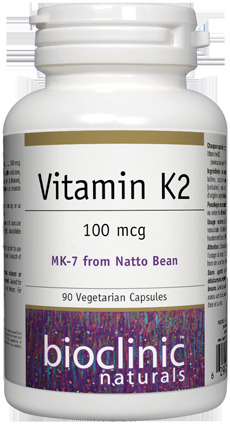 A greater intake of vitamin K, particularly K2, has been associated with lower all-cause mortality, coronary heart disease, aortic calcification, as well as cancer incidence and fatality.7,8 Higher intake of MK-7, which has the longest half-life and the most extra-hepatic distribution, has been associated with lower risk of fracture and greater BMD. Contains no artificial preservatives, colours or sweeteners and no dairy, wheat or yeast. Sealed for your protection. Do not use if seal is broken. For freshness, store in a cool, dry place.